Real Estate can be fickle. Many new brokers may not last because they simply don’t understand markets and that not all markets are the same. While some markets have been doing well for some time, Highlands/Cashiers area has had its struggles. Current trends are on the upside and may soon bring some relief to many Sellers and their agents. Understanding markets is what helps to distinguish a top real estate agent from many others. Brokers come and go because they think being a real estate agent is all about the money. That works well when the real estate market is strong, but when you’re competing with hundreds of agents in a stressed market, this can make or break a real estate agent. In the last several years, the Highlands/Cashiers Board of Realtors has seen many brokers come and go. Because of the many luxury homes, they feel they can make 1 or 2 good sales and they’ll be on top. If only that were so. Sales have been tough the last few years. However, all that may soon pass. May 2018 held strong and we’re just getting into our busy season. Many positive signs give Sellers and Brokers something to look forward too. A Good Economy – Let’s face it, if people don’t have money or jobs, that means they can’t buy, anything!!! While housing is needed, second homes are considered “luxury” items and not necessary. When you consider the majority of real estate in Highlands, Cashiers and Glenville areas are second homes, this means the economy has to be strong enough for individuals to consider a second home. Inventory – Too much inventory keeps prices down. Too little inventory causes prices to rise. A strong real estate market is keeping the inventory to around 6 months or less. That is, you don’t list more homes in a market area than you can sell in about 6 months. Considering the inventory in Highlands/Cashiers area, it had been over 2 years worth of inventory. It has now been reduced to about 16 months. Not great, but a great improvement over past years. Fair Market Price – Some brokers and firms have been noted for “buying” listings. That is, they will list a property higher than the market will allow. Why would any broker do this? To win “buy” the the Sellers favor. Sellers depend upon agents to tell them what the home can be sold for. This is based upon recent sales in the vicinity and doing a Comparative Market Analysis. However, these numbers can be skewed if a broker is trying to win “buy” the listing. Unfortunately, this does the Seller no benefit. Buyers determine market value. A top agent will help the Seller to see this. These are just a few of the elements that will help determine if a home may sale or not. Highlands, Cashiers, Glenville and surrounding areas are different from “typical” markets. Use the information and data that is available to you. Have your broker show you the data for “your” market area. For example, the MLS for Highlands/Cashiers Board of Realtors has long been distinguished by it’s market area. However, due to recent changes in rules from the National Association of REALTORS, many brokers from other market areas have now become members of this MLS. As a result, data that was once kept separate from these other areas is now included in the Highlands/Cashiers MLS. An astute or insightful broker understands this and will make sure that you are getting relevant information. Be sure to see where your broker is getting their information and what areas that includes. Total homes listed in Highlands/Cashiers MLS: 993 This is another increase in the inventory. However, compared with May of 2017, this is down about 200 homes. A positive sign. 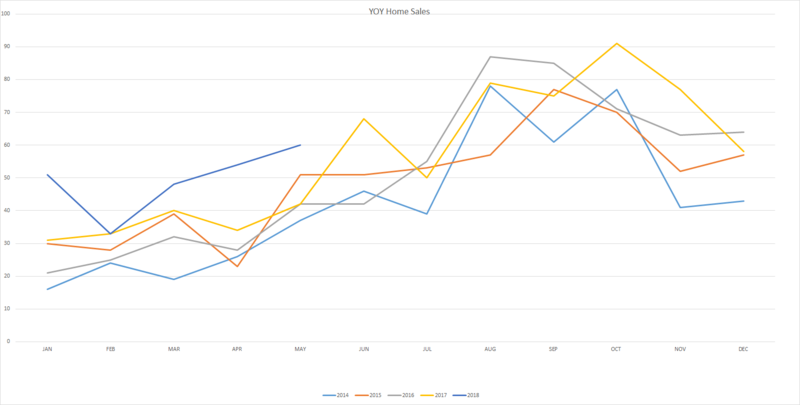 Homes Sold This Month: 60 This is a 43% increase over May of 2017. Another positive sign. Average Unit Sales per Month/1 Year Average: 62- This broker has seen this number average in the 40’s in past years. This is another positive sign to see real estate in this market is on the rise. YOY Inventory: 16 months. This number fluctuates depending on sales and current inventory. Compared with 24 month inventory in the past, this is still a positive in our current market. Average DOM: 305 This can help Sellers to understand that quick sales are not expected in this market area. Average DOM (YOY): 335 This “yearly” average is better indicator of the real estate market. This trend continues to drop. The positives keep adding up. Median Sales Price: $330,000. This is not average sales price. This is the best indicator of where the “middle” of the market lies. Average List/Sell Ratio: 92.38% – This number seems to stay about the same in this market. It shows at what percentage price a home sold compared to the amount it was listed. In other words, sellers are only getting about 92% of their asking price. In short, prices are considered to be too high by Buyers. Synopsis: Although there a plenty of positives, Sellers must consider their List Price. Listing to a closer Fair Market Price will help potential Buyers to consider one property over another. Listing high so you can negotiate a lower price may not be in your best interest. It may mean Buyers will simply overlook your property and look at another more accurately priced. Inventory: 43 months. 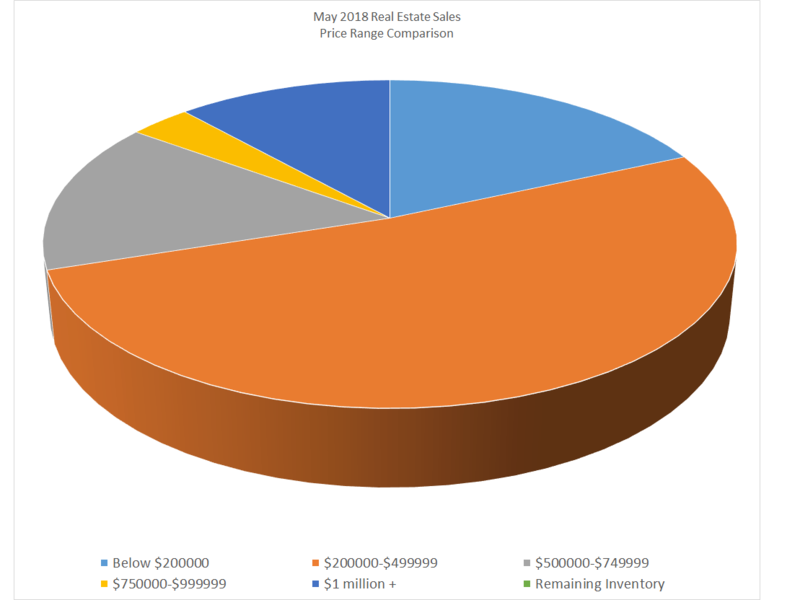 While this number is nearly 1/2 the previous months inventory, it is based upon 1 month of sales (May 2018) which saw a huge increase. This is the first substantial number in land sales we have seen in a long time. The majority of these were along main corridors and around Lake Glenville. Synopsis: We had one decent month in land sales. The spike in 2017 was due to one individual buying several parcels. Overall, land does not hold the same promise as homes. 9% of home sales ranged from $500,000 – $749,999. The overall “winners” for May were between $300,000 – $399,000. There were 16 homes in this price range that sold this month. BUYERS: The market is still good. There’s plenty of inventory to choose from in certain price ranges. However, the market continues to show overall growth. This will boost Seller confidence. Don’t hesitate in making an offer on homes of interest. More Buyers are coming on the market here. To hesitate cold mean another offer coming in soon. Be the first and negotiate early to get your purchase under contract. SELLERS: With all the inventory, this is still somewhat of a Buyers market. Still, if your home is priced correctly, you may be able to negotiate stronger. Make sure you are priced right. If your home has been on the market for some time, ask for an updated Comparative Market Analysis (CMA). Your Broker will be able to provide this to you. Examine carefully and consider your strategies. CONCLUSION: Positive for homes, steady for land. That’s the overall feel of this market. Outside and surrounding real estate markets have been doing well. This holds promise for Highlands Cashiers real estate market. DOM and inventory on homes is slowly falling. Don’t expect anything great on land just yet.